Line drawn illustration created for publication in the Illustrated London News. 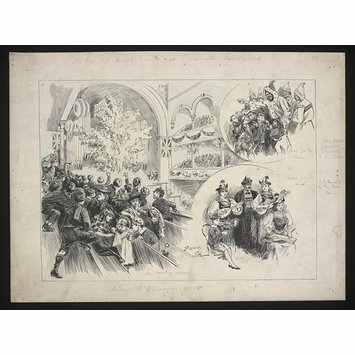 It shows the 'Christmas Tree Fête at Mr. Charrington's Assembly Hall, Mill End' in 1893 and is signed by the artist, Raymond Potter at the base. The bulk of the illustration focuses on the interior of the assemly hall, at the centre of which is a huge Christmas tree on the stage in front of the organ, decorated with toys and gifts. A group of families is seated in the stalls on the left, the majority of them young children. There are two further sketches framed in circles on the right hand side, one shows a detail of a Father Christmas figure wearing a fur-trimmed, hooded cloak, distributing chocolate and Bovril, providing 'Food for the body'. The sketch below shows the five members of the Tyrolean musical group 'The Meier Family' in national costume with their instruments including a guitar, a violin and a zither, providing 'Food for the mind'. This item is one of several theatrical drawings from a collection of sketches commissioned from contemporary artists to be printed in illustrated magazines. The collection was donated to the museum by Sir William James Ingram in 1914. Line drawn illustration created for publication in the Illustrated London News. 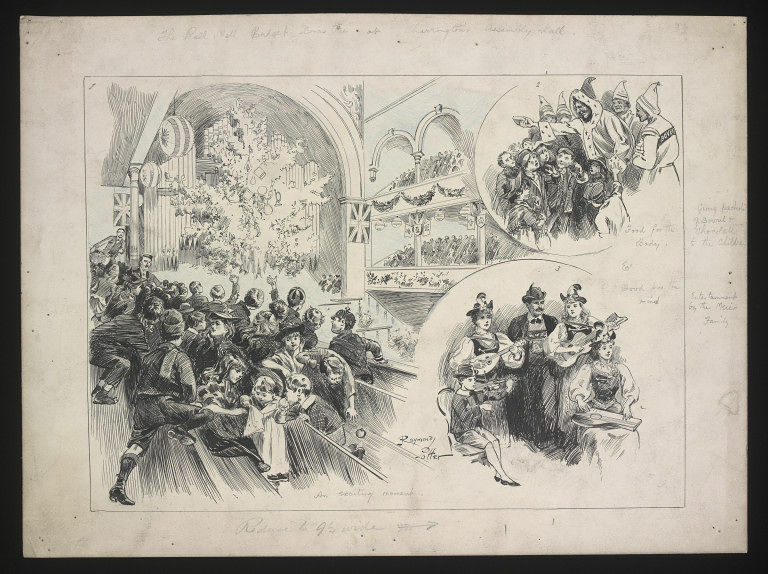 It shows the 'Christmas Tree Fête at Mr. Charrington's Assembly Hall, Mill End' in 1893 and is signed by the artist, Raymond Potter at the base. The bulk of the illustration focuses on the interior of the theatre at the centre of which is a huge Christmas tree decorated with toys and gifts. A group of families are seated in the stalls on the left, the majority of them young children. There are two further sketches framed in circles on the right hand side, one shows a detail of a man dressed in a fur trimmed, hooded cloak, distributing chocolate and Bovril. The sketch below shows the five members of the 'Meier Family' with their instruments. I.L.N./Christmas Tree Fête at Mr. Charrington's Assembly Hall, Mile End. Sir William Ingram (27 October 1847 – 18 December 1924) was a Liberal politician who was elected to, and sat, in the House of Commons on three occassions between 1878 and 1895. He was also the Managing Director of The Illustrated London News from the late 1870s until 1900 and became the proprietor of a number of additional publications including The Sketch and The English Illustrated Magazine. The Illustrated London News was the world's first illustrated weekly newspaper. Founded by Sir William Ingram’s father, Herbert Ingram, in 1842 the first edition was sold on 14th May 1842 at a cost of sixpence per copy. Building from an original circulation of 26,000 to in excess of 300,000 at its peak, The Illustrated London News remained in print until 2003 and commissioned illustrations from many of the leading artists of the late nineteenth century. Photographs were used alongside illustrations from the late 19th century onwards but illustrations were a major feature of paper until after the end of the First World War. This sketch was one of a group of prints and pencil and pen and ink sketches donated to the museum in 1914 by Sir William Ingram (1847–1924). Part of this collection was originally donated to the Prints and Drawings Department with the majority later passing to the Theatre and Performance Department. The full collection includes work by a variety of artists amongst whom are: A. J Finberg; Ralph Cleaver; F.V.Poole and Rossi Ashton. Though not all the publications for which they were created are identified the majority of the sketches were commissioned for, and appeared in, The Illustrated London News, The English Illustrated Magazine or The Sketch. Sir William Ingram became the proprietor of The Illustrated London News in the mid to late 1870s and remained in post until circa 1900 when he was succeeded by his he was succeeded by his son, Bruce Stirling Ingram (1877–1963). He also became the proprietor of The Sketch amongst other papers in which capacity he gave commissions to many leading artists of the late nineteenth and early twentieth century. Line drawn illustration created for publication in the Illustrated London News. It shows the 'Christmas Tree Fête at Mr. Charrington's Assembly Hall, Mill End' in 1893 and is signed by the artist, Raymond Potter. Given by Sir William Ingram in 1914.